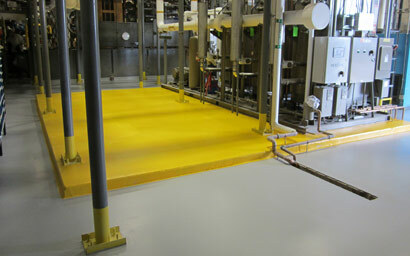 Flexible, waterproof membrane resistant to traffic abrasion, expansion, vibration and cracking. Ideal for mechanical rooms and parking garages. PermaFloor provides waterproof elastomeric flooring systems for equipment rooms, parking garages, loading docks and other indoor spaces requiring moisture protection. Our seamless elastomeric systems are flexible and remain that way for a long time, which gives your floor excellent resistance to vibration and cracking, along with impact and abrasion protection. Elastomeric flooring systems are flexible, so they expand and contract to create an unbreakable waterproof membrane that works well over jointed or cracked surfaces. This flexibility also prevents substrate cracking and spalling in applications subject to constant structural vibration or compression such as mechanical rooms and loading docks. Our formulations will typically bridge hairline cracks up to 1/16-inch. A variety of topcoat formulations give you added slip resistance and protection from chemicals, oils and UV light. Products are VOC compliant with excellent color stability and a range of color choices. Typical Thickness: Formulations range from 30 to 90 mils. Drytime: Typically 24-hours for normal operation. Specification Sheet: Elastomeric System PDF. Considerations: Check out our Fast Cure MMA and Urethane Concrete Flooring Systems, both of which work well for moisture sensitive applications in food processing and restaurant environments.